Jan Hansen says "What a treat to see an icebreaker that has received several commendations for exceptional service. 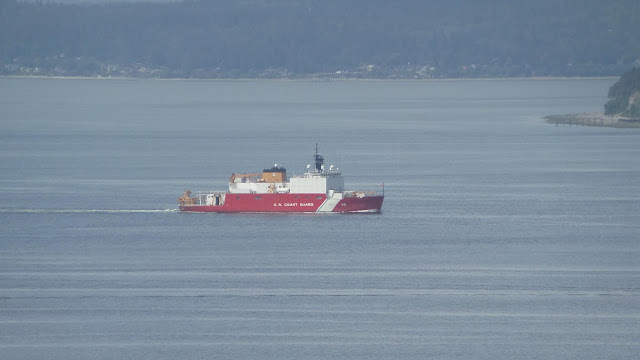 Today the USCG Healy sailed by as she headed out; her ETA back is 21 November." USCGC Healy (WAGB-20) is the United States' largest and most technologically advanced icebreaker as well as the US Coast Guard's largest vessel. In addition, it is the US Military's only surface vessel capable of operating in the Arctic. She is classified as a medium icebreaker by the U.S. Coast Guard. She is homeported in Seattle, Washington and was commissioned in 1999. On September 5, 2015, USCGC Healy became the first unaccompanied United States surface vessel to reach the North Pole. USCGC Healy is an optimally manned vessel, meaning she has the minimum number of personnel staffed in order to safely navigate. Due to the vast array of missions conducted by Healy, it is vital that crewmembers are fully qualified on a number of duties. Healy operates two A-Frames, one on the aft working deck and one on the starboard side. There are two articulated cranes on the aft working deck, with the starboard side rated to 15 short tons (14 t) and the port side rated to 5 short tons (4.5 t). The aft working deck provides ample space to conduct science and research operations. Healy has a forecastle crane with a load capacity of 3 short tons (2.7 t), and two 04 level cranes with load capacities of 15 tons each. Healy has a Dynamic Positioning System (DPS) that uses its Bow Thruster system, which aids in navigation and station keeping during science operations. Its flight deck is capable of landing both of the Coast Guard's helicopter airframes, and attached is a hangar that can house 2 HH-65 helicopters. Healy can accommodate 8 ISO vans on the ship, which are used as science labs and workstations. Healy has three small boats on board. One is the 38 ft (12 m) Arctic Survey Boat (ASB), which is on the starboard side. Healy has two 26 ft (7.9 m) Cutter Boat Large (CBL) Rigid Hull Inflatable Boats (RHIB), one on each side. October 29, 2015: USCGC Healy received the Coast Guard Unit Commendation award for exceptionally meritorious service from 24 June to 29 October 2015 during their Arctic West Summer 2015 deployment. Healy traveled over 16,000 miles, took over 25,000 water and ice samples from 72 science stations, and became the first unaccompanied U.S. surface vessel to reach the North Pole. She also engaged with the crew of the German icebreaker Polarstern while at the North Pole in support of the international scientific mission Geotraces. Finally, Healy became the first vessel to broadcast a live feed from ice-bound Arctic waters, streaming video of a search and rescue exercise to shore-based coordinators.